Moving is all about safe and efficient relocation of your items and belongings. A safe and efficient transportation requires the right packaging and labelling as the last thing you need is broken or lost items along the way. In order to take the guess work out of packing and make sure everything reaches the new destination safe and in one piece, we can provide you with comprehensive, cost effective packing service that will cancel out the margin for error and give you the coverage you need. Our specially qualified, professional mover teams will visit your property in a suitable time and review what needs to be moved. In turn the movers will determine the most appropriate and safe way to package and secure the items as to ensure everything reaches the new location perfectly intact. We will take special care of high value items such as antique furniture, art pieces of priceless memorabilia. We will provide all the required packing materials like boxes, tape, black bags, bubble wrap, etc. and go about packing quickly and efficiently. Our mover teams will use different size and strength cardboard boxes depending on the weight of the items which need to be shifted. We also watch out for the environment and always work with recycled cardboards and packing materials. Discarded boxes and packing materials will be given for recycling if they cannot be used any longer. 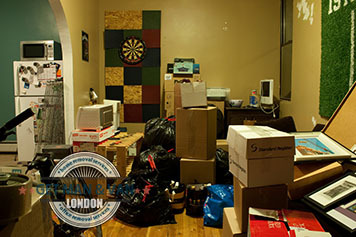 Man with van removal in London, no matter whether domestic or commercial, is usually quite stressful and troublesome. Having no reason to worry about the safety of your goods while they are on the road is one of the best ways to reduce the hassle on your moving day. Our packing service has been designed and is delivered with the sole purpose of making sure that is exactly what will happen. The packing service is available to both residential and commercial customers. If the size or complexity of your service request is quite large, we will need a sufficient prior notice in order to organise the packing materials and the packing itself in the most efficient and affordable manner. Professional packing of items that need moving will ensure safe transportation, we advise you not to risk your precious belongings but let us pack and load the items adequately and safely. The service is available for booking seven days a week with flexible hours. We have good short notice availability though this depends on the size of your service request. We will provide you with an individual, free, no-obligation quote. London has a population of 13 million people and counting. The huge metropolitan area of the capital is divided into 33 boroughs and the City. Great residential suburbs can be found to the north of The Thames. Many cultural institutions and major tourist attractions, like Kew Gardens and the London Zoo are in South London. It is a diverse and very vibrant city, which is deservingly considered to be one of the best in the world. Property Damage – How to Avoid It When Moving Home?